CINCINNATI -- Clifton native and Cincinnati attorney Peter lost his first wife to breast cancer in 2000 and reared their two children in a stately Hyde Park home. In 2013, the empty-nester started shopping for a smaller condominium fit for a single man in his late 50s. 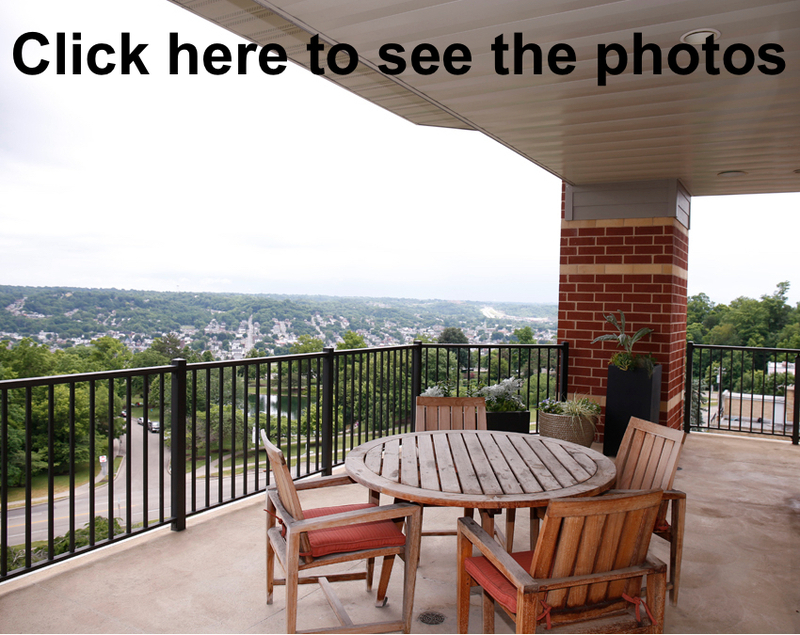 He narrowed his choice to two similarly priced units, both located right off Eden Park in Walnut Hills: the northwest-facing penthouse in St. James in the Park and the south-facing, seventh-floor unit in the Overlook at Eden Park. The river and park views throughout the 2008-built Overlook condo, its abundant natural light, its 9-foot and 10-foot ceilings, its upgraded features and finishes and its open layout -- perfect for his son and daughter when they came home -- sealed the deal. He was able to buy the complex's model unit, which was in receivership, before it came onto the market. But it didn't last long as a bachelor pad. That's because "Cupid struck," Peter said, when he met Lucy at a party hosted by one of his friends in her Mount Adams neighborhood. When their relationship got serious and Lucy was facing a transfer within Procter & Gamble, "she had to choose between Geneva and me," Peter said. Lucy chose Peter, and they married in her hometown of London, England, in June 2015. Sharing the condo with Lucy has been wonderful, Peter said, although it had not been part of his plan. "I thought this was going to be a bachelor pad. That's why it has a shower for six," Peter joked. Lucy glows when talking about her and Peter's place. She said she loves that their home is such a great lookout for watching riverboats and barges go by, the sky opening up in the morning, the sun setting in the evening and the changing seasons. Looking down on Eden Park's Twin Lakes and walking through its manicured gardens is fantastic, she said, but the avid gardener missed getting her hands in the soil and bringing out the beauty in her plants. "Lucy, like a proper British person, loves her garden, so I've been dodging and weaving for four years," Peter said. The ranch house the couple has purchased in Hyde Park will benefit from her skills, yet the couple will miss their condo greatly. The 3-bedroom, 2½-bathroom unit with a 500-square-foot covered terrace and 3,053 feet of living space is now for sale at $1.145 million. The Overlook at Eden Park is a 12-floor affair, which places Peter and Lucy's condo right in the middle. That's perfect, they said, because it provides them views of Twin Lakes, the historic Eden Park Standpipe and avenue bridge, the Ohio River, and, when the leaves have fallen off the trees, Mount Adams and the top of Cincinnati's skyline. They can see all of that from their living room, whether sitting or standing. "It is breathtaking, and I'll miss that beyond all measure," Lucy said. "Really, it has that feeling of nature inside and out." The unit features two sunny, west-facing bedrooms linked by a Jack-and-Jill bathroom. Lucy, a career P&G global-marketing specialist now on her own as a consultant, works from home in the center bedroom across the hallway from a powder and laundry room. The master-bedroom suite faces north and features a 5-foot-wide hallway with sliding pocket doors on either side that lead to his-and-her walk-in closets. The hall leads to the master bathroom, which features chocolate-colored cabinetry, a dual-sink vanity and the aforementioned shower for six. A door beyond the shower opens to a small lobby where there is a garbage chute. It's also where Peter chose to display his late wife's Big Pig Gig entry sponsored by Tiffany & Co. for ArtWorks titled "Un Cochon dans le Jardin" (A Pig in the Garden). She passed days before the 2000 Pig Gig auction, and the pig she painted was pulled from the sale and given to Peter's family. "Un Cochon" will make the move to Hyde Park, and Peter and Lucy said they are excited to find it a prominent place, possibly in her new garden. Whereas the unusually large terrace facing Dayton and Bellevue is a show-stopper -- "You can throw a baseball right into Eden Park from here," Peter said -- the views from the main living area can compete. Visitors step right into the space through the front door. Ahead is a double-molded, formal dining space that features a dramatic view of Eden Park’s red brick-and-stone standpipe that was part of Cincinnati's revolutionary water system installed in the late 19th century. Its history, said preservation advocate Peter, has faded some over the years, but the standpipe played an important role as a water tower and fire lookout for the Cincinnati basin. Reopening its open top to tourists could bring more people into Eden Park, Peter said, which many consider to be the crown jewel of the city park system. Beyond the columns is the living room, an open space with four 7-foot-high windows facing Kentucky, a direct-vented fireplace that's flanked by built-ins and a 10-foot-high tray ceiling. Two doors lead off the space to the terrace, which Peter describes as being "the best in town." It includes a gas line for a grill, a double-wide storage closet and six large planters for seasonal flowers. Condos at Overlook at Eden Park come with two parking spaces and a storage locker located in a secure lot underneath the building. The complex also has a fitness center and clubroom.